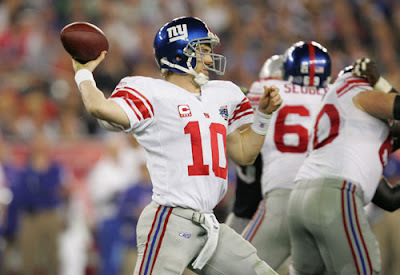 Eye On Sports Media: Congratulations to Eli Manning and the Giants! Congratulations to Eli Manning and the Giants! Athens, GA (Feb 3, 2008) - There is a reason the game is played on the field, if for nothing else to show how wrong the pundits and oddsmakers can be. As a lifelong New York Giants fan, I am pleased as punch at tonight's outcome in Super Bowl XLII. Giants 17, Patriots 14! Watching Eli Manning refusing to fold when it would have been easy was pure joy. To quote a one-time presidential cadidadate: YEAHHHAHHHAHHAHHHAHHAHHHHH!